Simulating a roadside investigation of a potentially intoxicated driver, Colorado state Trooper Cpl. R.P. 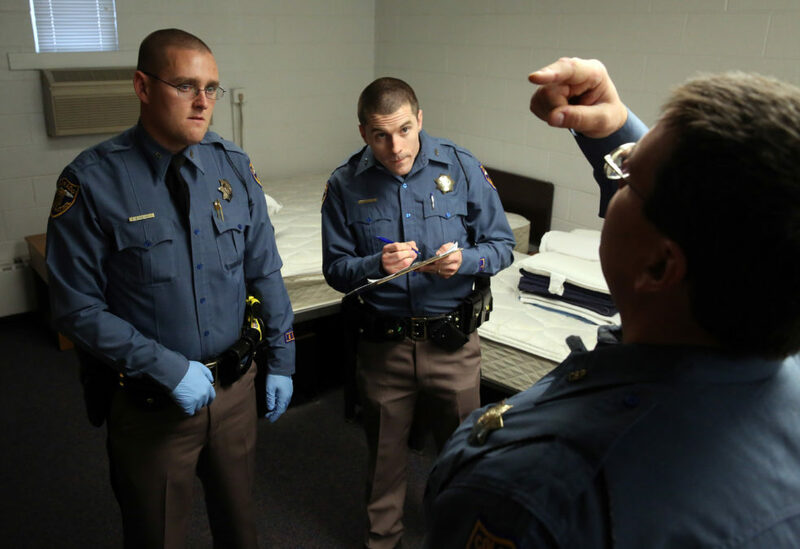 Meyers (right) pretends to be high as he trains Troopers Josh Pritchett (left) and Louis Anderson in a drug recognition expert class at the Colorado State Patrol Training Academy in Golden, Colo. This investigation was published in partnership with The Marshall Project, a nonprofit news organization covering the U.S. criminal justice system. Sign up for their newsletter, or follow The Marshall Project on Facebook or Twitter. The legalization of marijuana in Washington state and Colorado had at least one unanticipated effect on the streets: a sharp decline in the number of traffic stops resulting in searches by state police, a new analysis shows. The drop means fewer interactions between police and drivers, potentially limiting dangerous clashes. 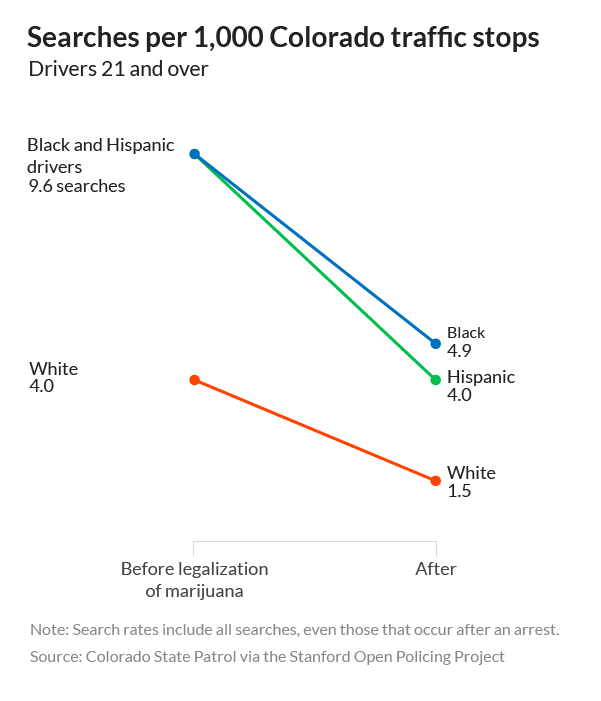 But even though the number of searches fell significantly for all racial groups, black and Hispanic drivers are still searched at higher rates than white motorists, the analysis found. Reveal from The Center for Investigative Reporting in partnership with The Marshall Project reviewed stop and searches conducted by Washington and Colorado state patrols before and after marijuana became legal in both states in late 2012. The analysis was based on data obtained by researchers at Stanford University who released a report this week studying 60 million state patrol stops in 31 states between 2011 and 2015, the most comprehensive look at national traffic stops to date. The data does not offer a complete picture because it includes only stops by state patrol agencies and not local law enforcement. For instance, in Washington and Colorado, the data would not include stops made by local police in Seattle or Denver, where African American residents are concentrated in those states. It is possible that pot legalization has not had the same effect on urban traffic stops as it has on those made by highway patrols because policing strategies differ, said Charles Epp, a University of Kansas professor who co-authored the 2014 book “Pulled Over: How Police Stops Define Race and Citizenship.” State police tend to focus on accidents, impaired and reckless driving, and the transport of illegal drugs. City police concentrate on crime deterrence and response. In the city of Colorado Springs, Ryan Brown, an African American Iraq war veteran, won a $212,000 settlement after local police pulled him over a block from his house after a trip to the grocery store in 2015. When officers couldn’t provide Brown with a clear reason for stopping him and his younger brother, he said he began to recall fatal confrontations between police and black men such as Michael Brown and Eric Garner. He started recording on his phone. “What’s the reason that you pulled us over, officer?” he asked. A white officer unbuckled Brown’s seatbelt, pulled him out of the car and forced him onto the snow face down with the officer’s hand pushing down on Brown’s head, the video shows. The last images of Brown’s video show the officer slapping at the phone in Brown’s hand, ending the recording. The police department has maintained that it did nothing wrong. “If they see you and they’re racially profiling, that happens. I don’t think weed has anything to do with it,” said Brown, 33. According to court papers, the officer pulled over Brown’s car because he believed he had seen it hours earlier driving slowly through a “high crime area” where “lots of drugs (were) being sold.” No drugs were found in the car, and the Brown brothers have said they were home at the time. The explanation demonstrates what traffic stops represent to many officers: the means to search for evidence of more serious crimes such as illegal drugs or weapons. “It’s like the triple-word score in emphasis for police,” said Steven Bender, an associate dean at the Seattle University School of Law who has researched links between race and marijuana regulation and legalization. The Stanford study suggests that removing marijuana possession from the potential list of crimes lowers the chance that a car will be stopped and searched. And the numbers are striking. In Washington, the search rate of black drivers age 21 and over decreased by about 34 percent after legalization, according to the analysis by Reveal and The Marshall Project. Search rates of white and Hispanic drivers in the same age group declined by about 25 percent. Still, racial disparities remained: Both before and after legalization, black motorists age 21 and over – the legal age for buying pot – were searched at a rate roughly twice that of white drivers. The search rate for Hispanics was about 1.7 times that of whites. In Colorado, the search rate of African American drivers 21 and over dropped by nearly half, while the search rate of Hispanic drivers fell by 58 percent. 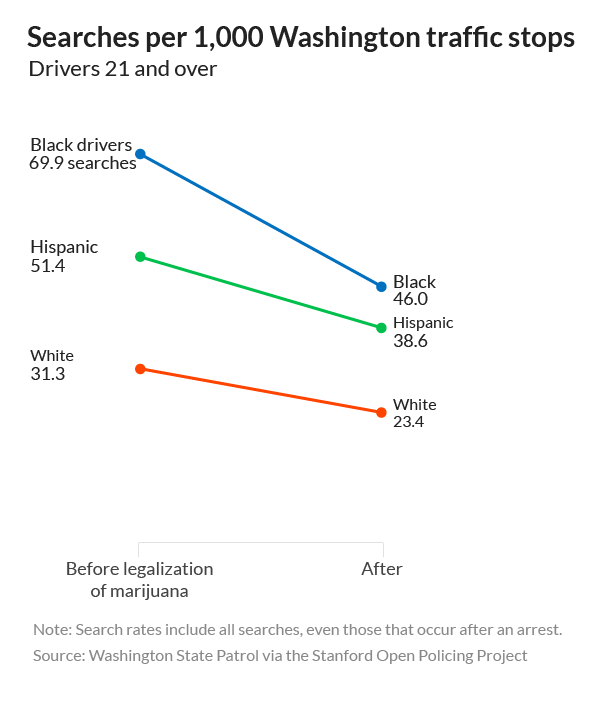 White drivers faced almost two-thirds fewer searches after recreational marijuana was legalized. Racial disparities, however, also persisted in Colorado even as overall numbers of searches went down. After legalization in Colorado, the search rate for African American drivers was 3.3 times that of white drivers, and the rate for Hispanics was more than 2.7 times that of whites. The findings on stop and searches are similar to those showing a decrease in the number of marijuana arrests in Colorado after legalization, according to a 2016 Colorado Department of Public Safety report that reviewed legalization’s wide-ranging impacts. The study showed that the total number of marijuana arrests dropped by nearly half after legalization, but the marijuana arrest rate for African Americans was almost three times that of whites. The Colorado and Washington state patrols were provided with findings of the analysis but did not respond to requests for comment. The ACLU has advocated requiring law enforcement agencies to have “objective facts” that amount to reasonable suspicion before asking a driver for consent to search a car, Silverstein said. In 2010, Colorado passed a law requiring officers to tell drivers that consent is voluntary. Anna Flagg contributed to this story. It was edited by Kirsten Danis and copy edited by Stephanie Rice. Justin George can be reached at jgeorge@themarshallproject.org, and Eric Sagara can be reached at esagara@revealnews.org. Follow them on Twitter: @justingeorge and @esagara.